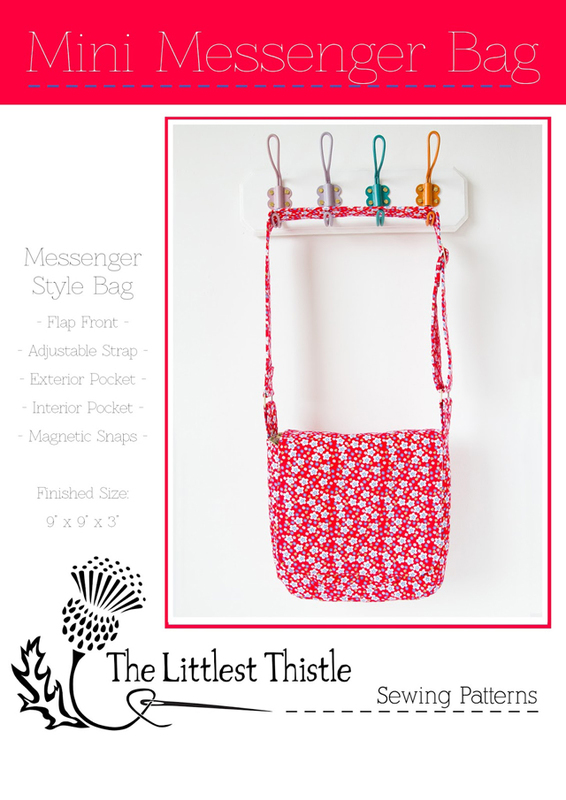 I got to test a pattern for Katy of The Littlest Thistle! I’ve seen her make some fun bags so I was excited ot try this one. 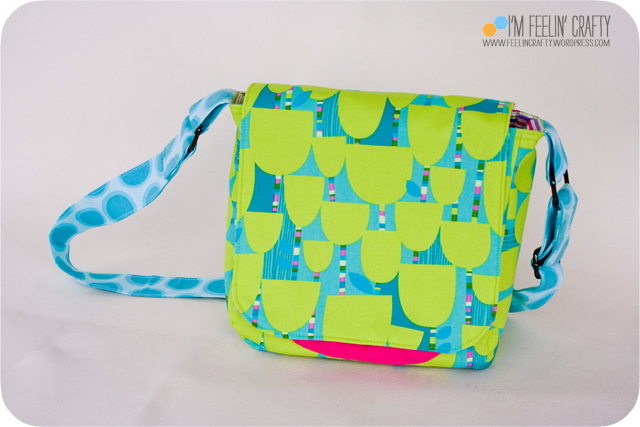 This one is the Mini Messenger Bag. 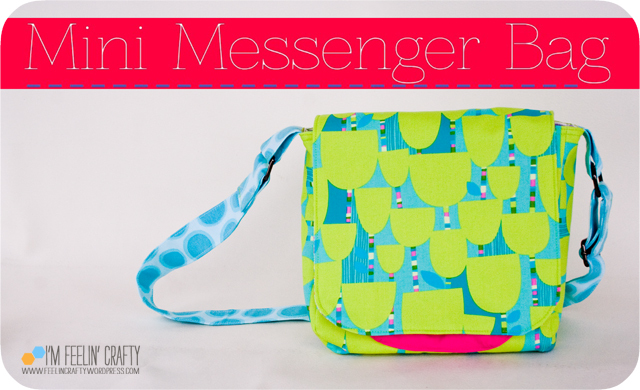 I’ve made messenger bags before, but I was interested in seeing what made her’s different from the others. One is the size. It’s mini! It is exactly the right size for a kiddo, for sure. I wanted to make it for my son, but he didn’t want one. At least not until he saw mine…. The picture on the cover is a little girlie and I think he was blinded by the floral fabric. Because when he saw mine in person, even though it’s a little girlie though, he wanted mine! But I said no! And I used it the other day and it’s great! The second piece about it that was new to me was the insides! 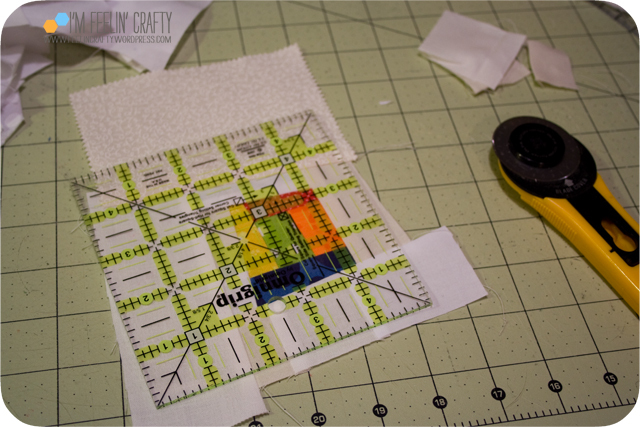 The pattern calls for some fusible interfacing that I had never actually used before. 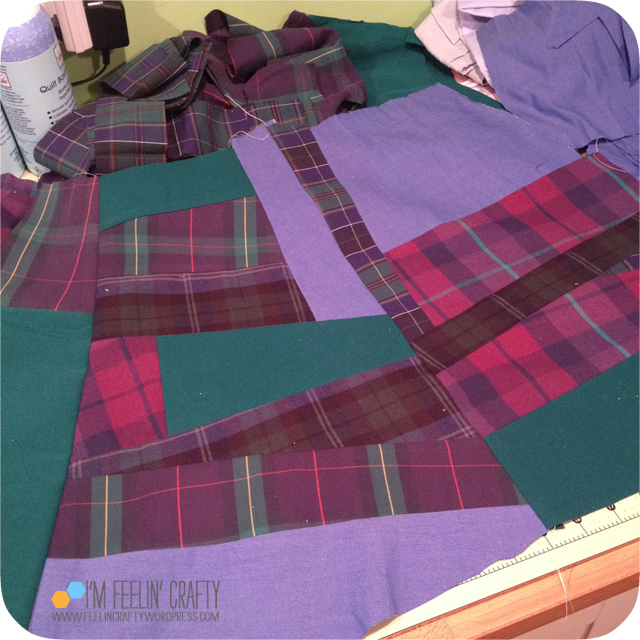 A woven interfacing, which I also learned is fantastic for clothing. 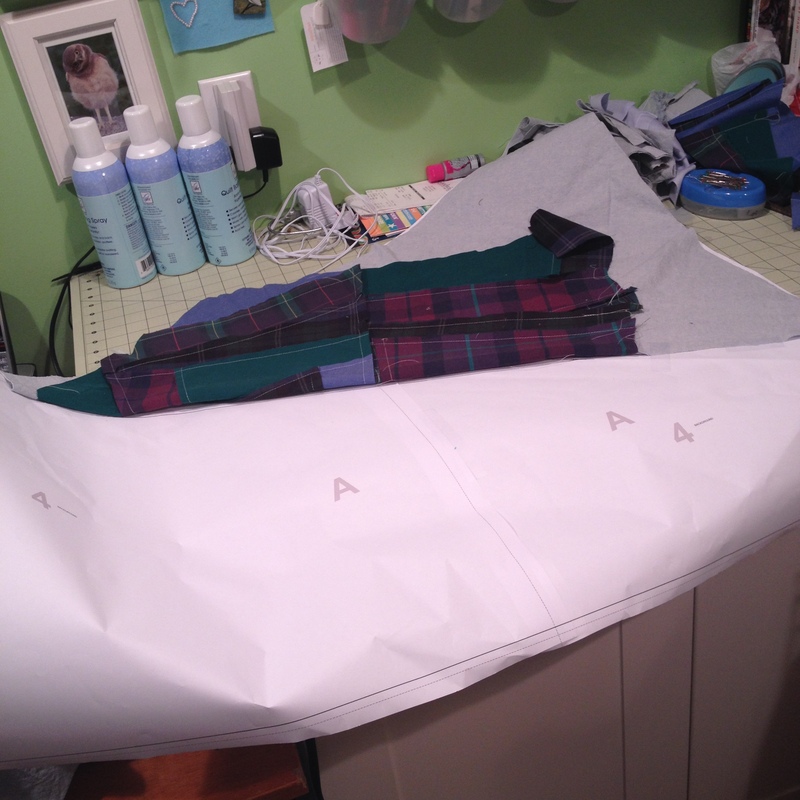 And a fusible fleece. 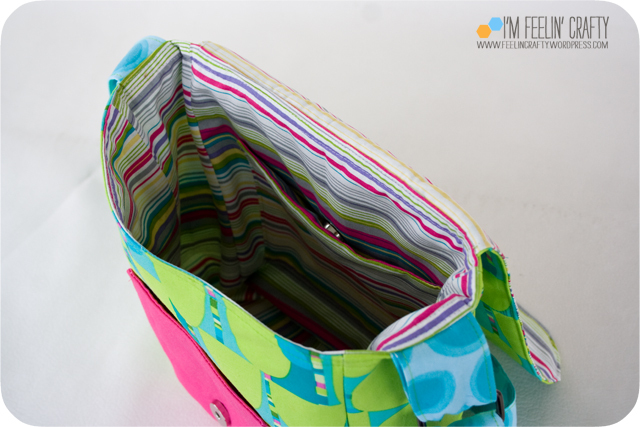 I’ve seen this before, but typically skip it since it isn’t in my sewing room… This time I bought it and the two interfacings really do give the bag a big sturdy shape! 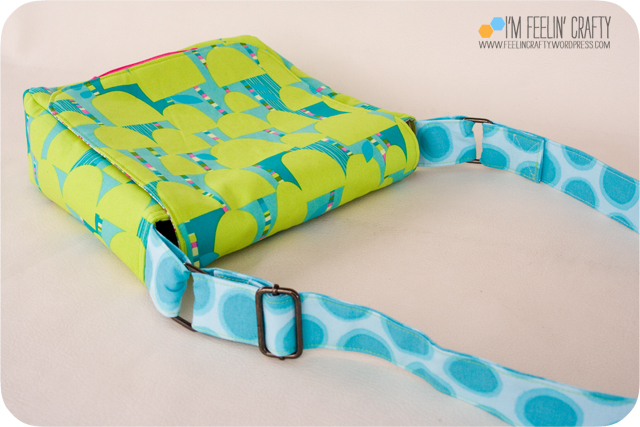 Lastly, for new ot me sewing, I have never done an adjustable strap! 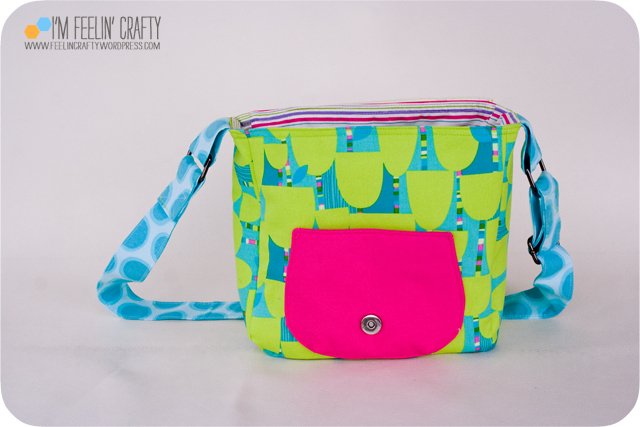 It seems like I would have with all the hundreds of purses I’ve made in my time (I used to sell purses…). But no! Super easy! 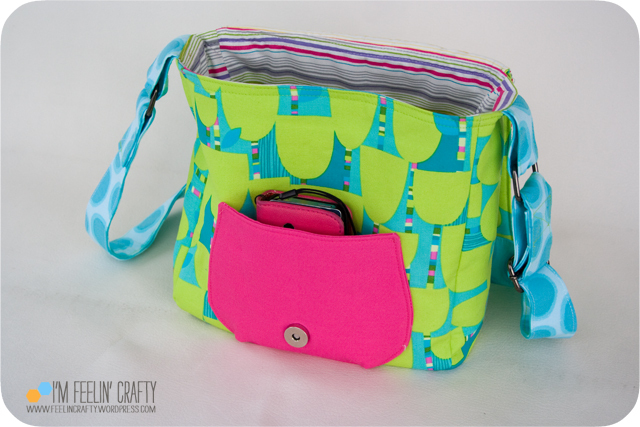 I love a purse with an inside pocket! And it has one included in the pattern! Next time I might put one on each side. The outside pocket is perfect for my phone! I made it the contrasting color, but in hindsight, I think I’d stick with either the same color or at least not as contrasting because part of the pocket shows under the flap. which I didn’t realize in the process! And its’ a great size for a stuffie! I couldn’t resist, since this guy looked so cute in it! I actually didn’t carry Mt. Doodles around in it. I used it for carrying books and I really loved how the strap felt on my shoulder. I have a problem with bags falling off my shoulder, but this one didn’t! 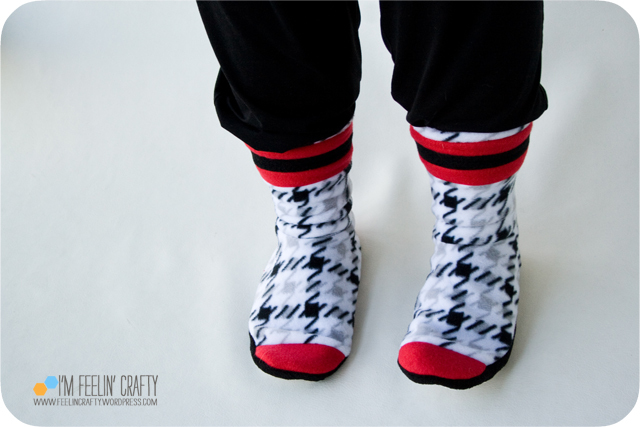 Now to get your own pattern! 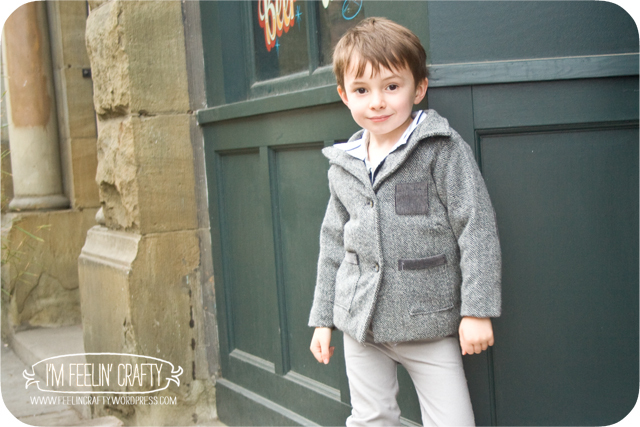 You can purchase the pattern here at Katy’s shop. 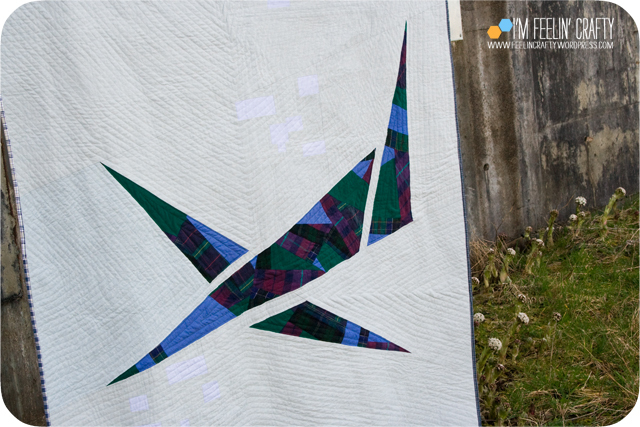 To celebrate the launch of her new pattern she’s offering 25% off ALL the patterns in her shop! Hurry over, the discount is available until April 10th with the code HOPPYEASTER15. 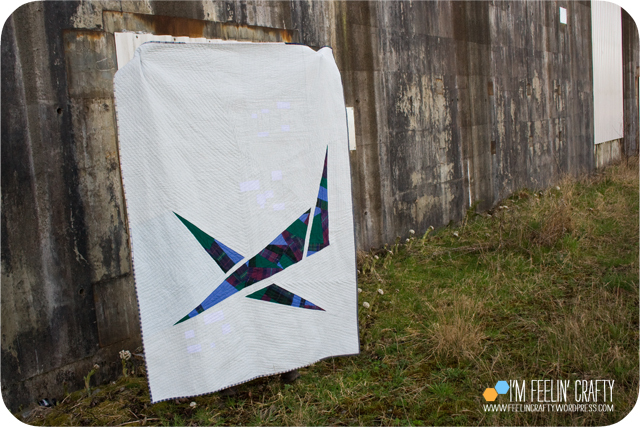 De Plane, De Plane, De Quilt! The funny thing is, we were flipping through the channels the other day and Fantasy Island was on! I hadn’t seen that in ages! 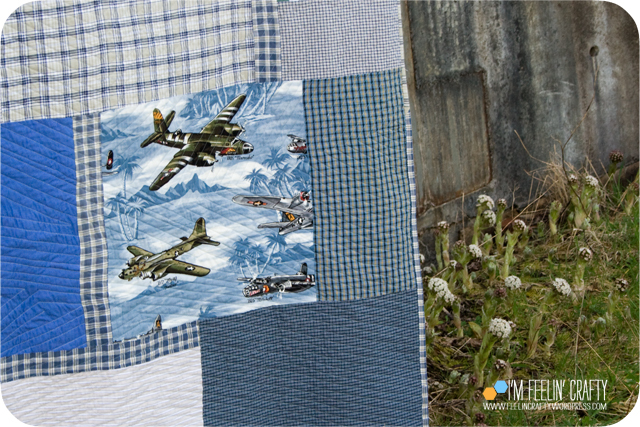 Anyway, Fantasy Island has nothing to do with this quilt, but planes do! 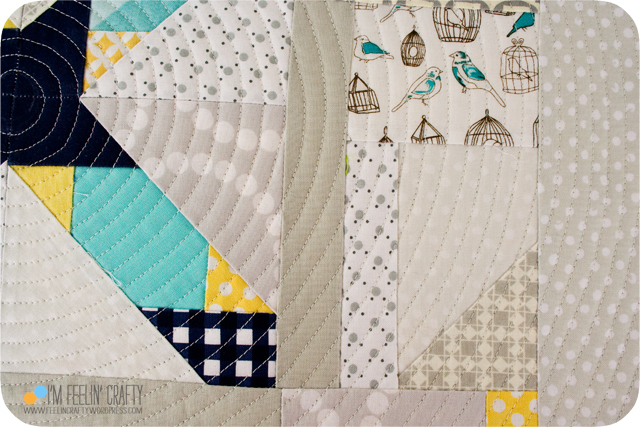 This quilt is my first finish for 2015! But was supposed to be done a couple of years ago. 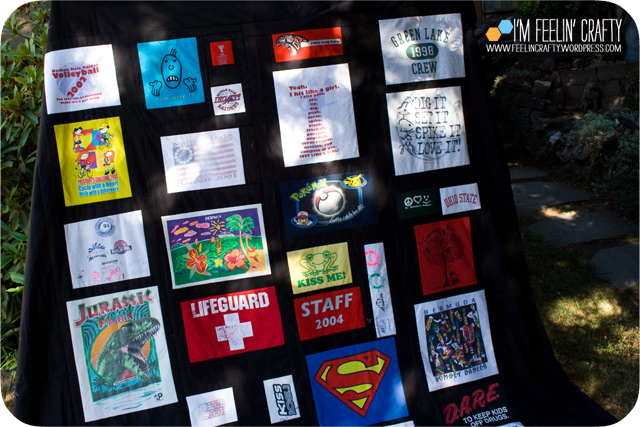 This is a memory quilt for a very wonderful family friend. Our families have been close for years. But a couple of years ago we lost the Mr.
Mr. was the father of one of my best friends growing up. I guess it was middle school when we were always at each other’s houses. Mr. was like a second father to me for years. Mr. was an incredible man and had a wonderfully rich life with a large family and a lot of adventures! And you’ve probably guessed it… He was a pilot! 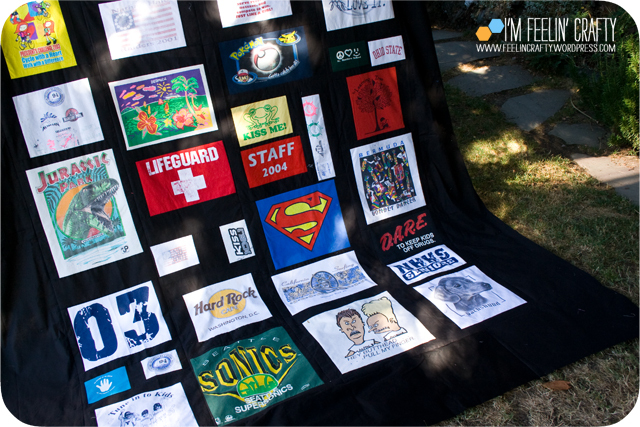 I went home not too long after he passed and was able to collect a lot of his shirts. I had a traditional idea when I first asked if I could do this for them. But it obviously didn’t ring right to me. It then took me a couple of years, walking past this bag of shirts everyday and thinking about the right thing to do. Then it hit me! I had to do a plane! 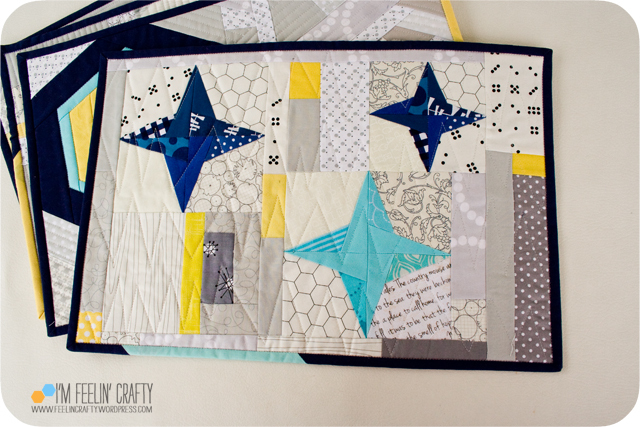 But I wanted it to be graphic, not a detailed paper pieced replica of a plane. A graphic representation. I was also going to ONLY use the shirts. 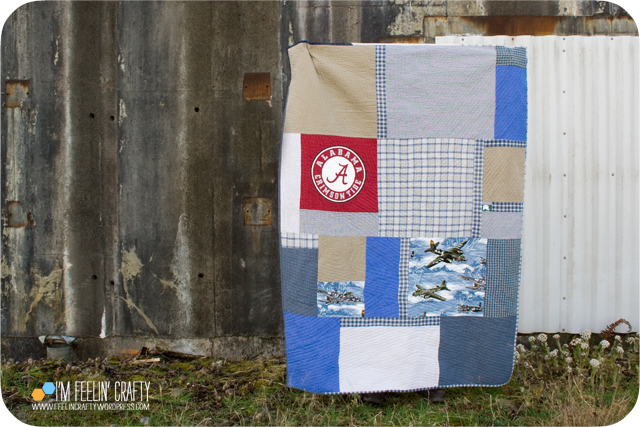 But to make the plane pop, I decided to actually use an Essex Linen as a more neutral background. I did add in little pops of a blue shirt for ‘clouds’. They are actually a little harder to see than I planned. 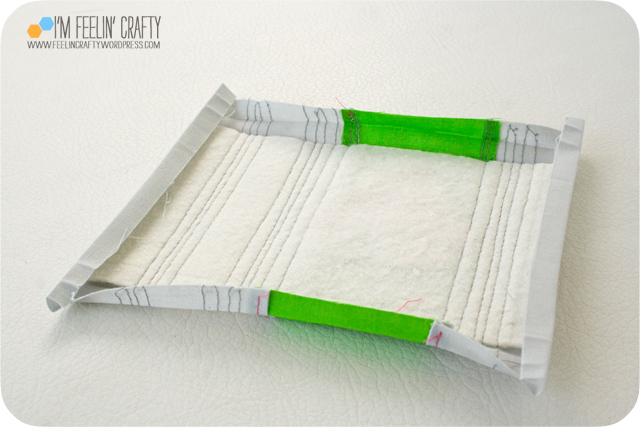 I love the close stitching that follows the lines of the plane! It took way longer than I was planning, but oh, well! For the plane, I made a little improv piece and then cut it apart in pieces to make the plane shapes. The back has a little more traditional feel. 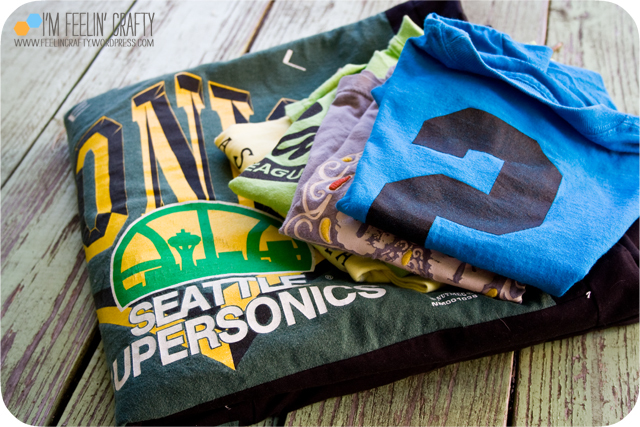 Using all his shirts, including a tshirt. That big Bama shirt was a must! I couldn’t NOT use his plane shirt! And I think he flew almost all the planes, if not all of them! For the binding, I continued to use the Mr.’s shirts. 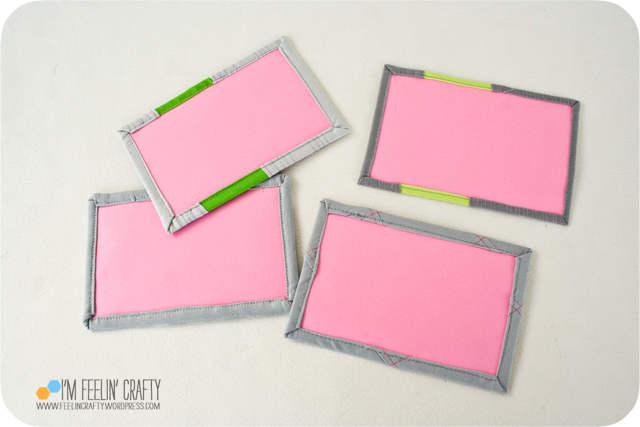 It’s a scrappy binding. I’m crossing my fingers that the family loves and enjoys it for years to come. It’s not a very traditional design, so I’m crossing my fingers they like it! I hate that it took me so long to get it to them, but I think it was worth the wait to come up with a design that spoke to me about the one, special Mr. that it was made to remember! 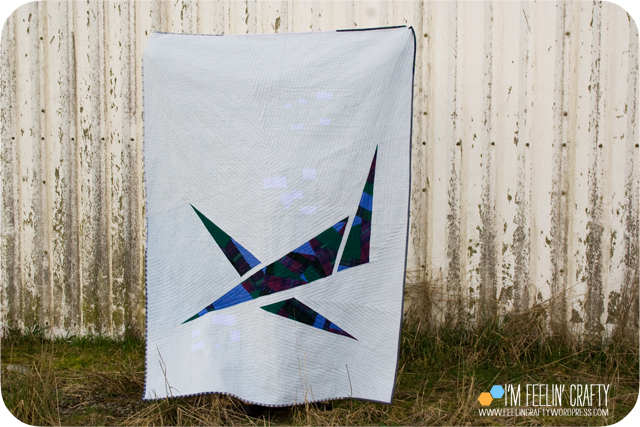 This is my first (and unfortunately might be my only) completed project from my Quarter 1 Finish Along list…. A really cool Spoon! And then I decided to buy some cool napkins at Bed Bath and Beyond to go with the spoon. 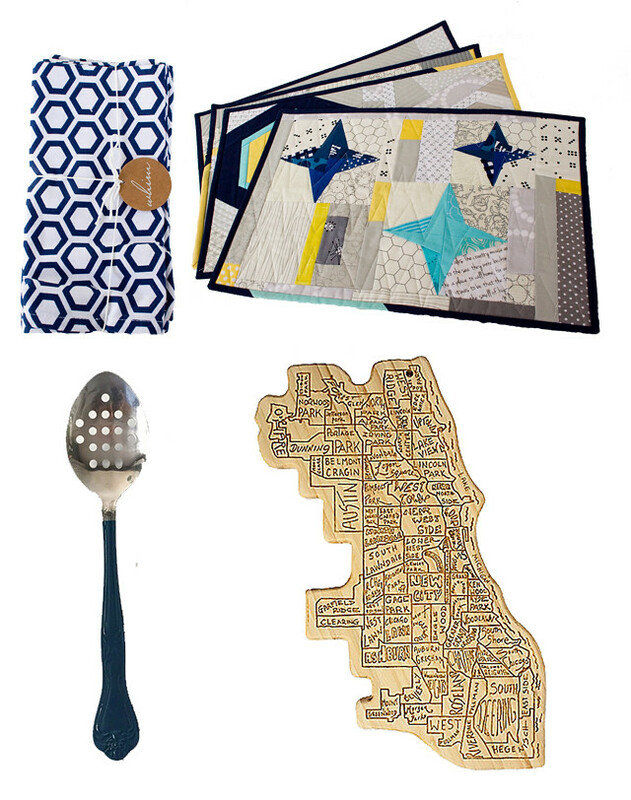 When I found the awesome napkins, I also found a really cool Seattle neighborhood map cutting board (yes this one is Chicago, but our store actually had Seattle even though it’s not online. Trying not to take that personally…). 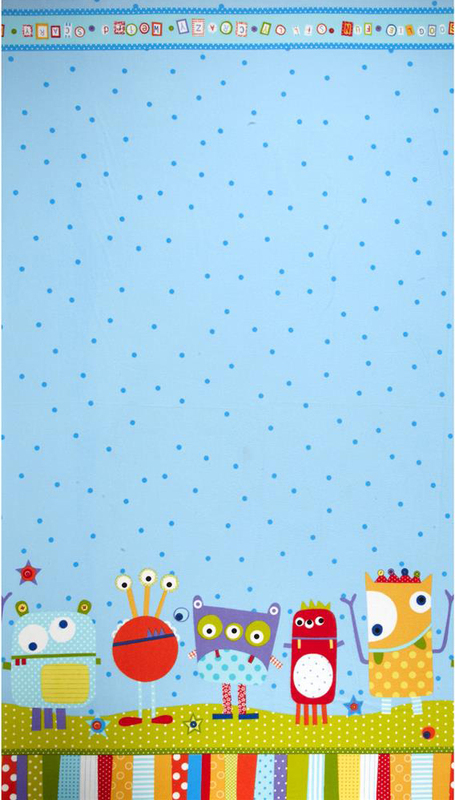 And then of course, you need placemats to go with everything else! So I made placemats! Everyone needs them. I love making them. So why not! 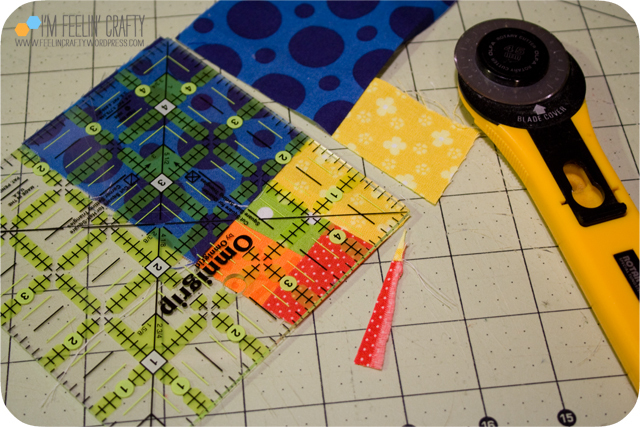 This one I used one of my favorite patterns, the Mini Trajectory Paper Piece pattern by Simply Cotton! 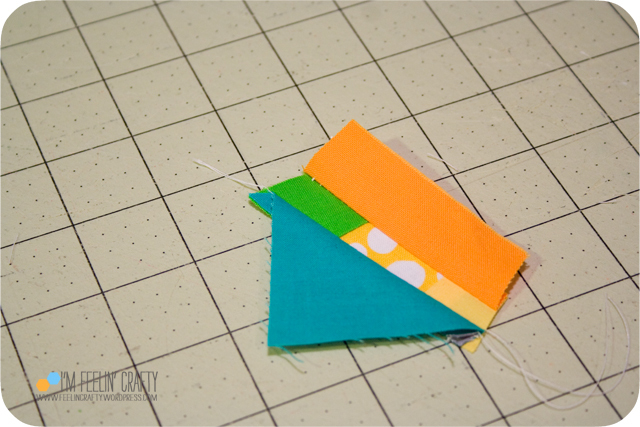 I’ve used it before a few times… Once for a do Good block, I made a placemat for us with it and I used it for my paper piecing tutorial! The wonky log cabins is a favorite. No pattern here! 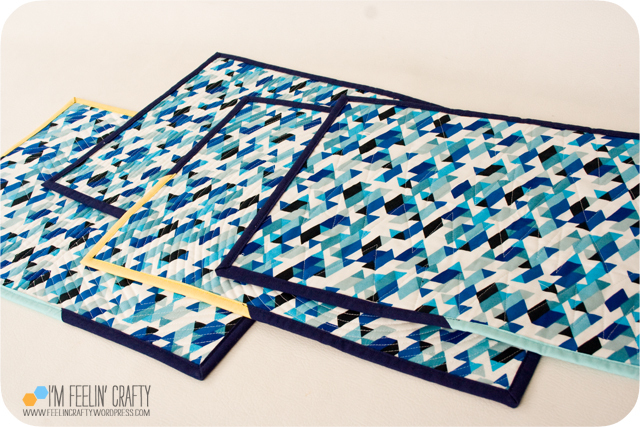 Another no pattern mat… Just some hexi’s to match the napkins! 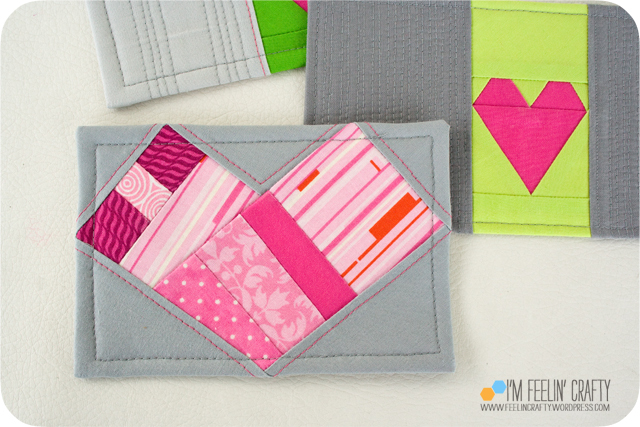 Again, a bit of paper piecing with improv! 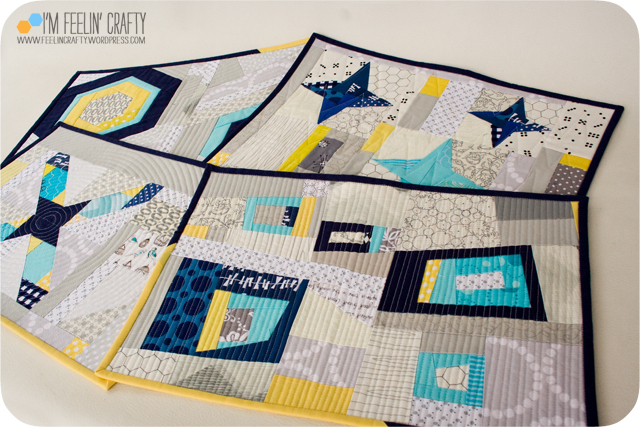 This pattern is a free pattern from Wombat Quilts, the Star String Paper Pieced Pattern. 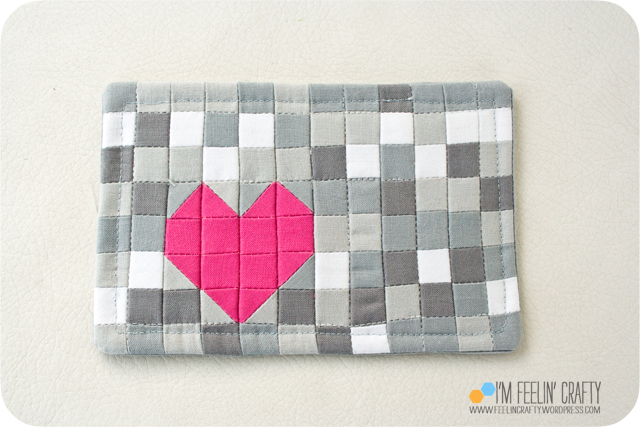 I did have to scale the pattern down a bit, just like I did with our placemats! I do love the circlular stitching. 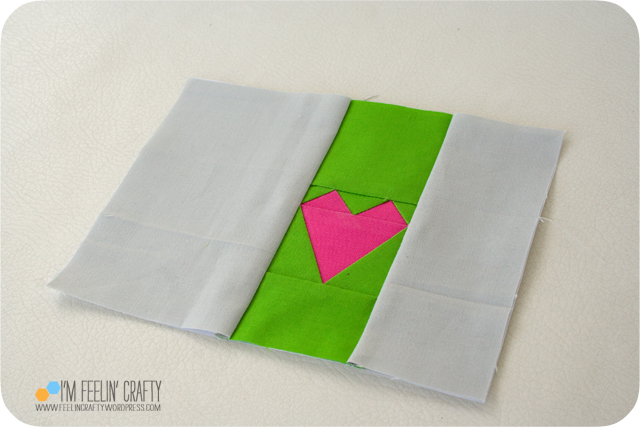 I haven’t attempted it on a large quilt yet, but it looks awesome on the little placemats! 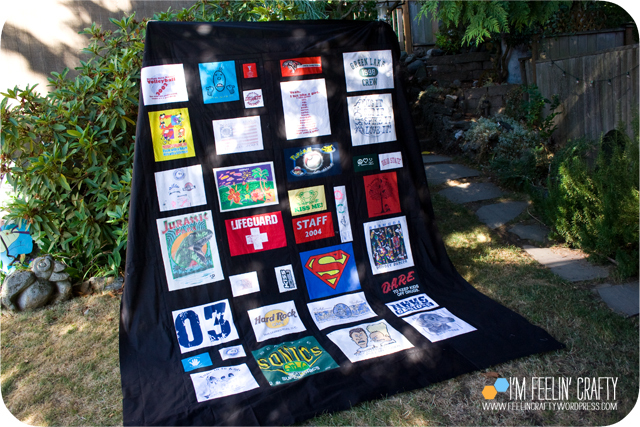 And for the back, I used some fabric that I had been hoarding…. For the whole project I used fabric from my stash! So that felt really good! Don’t they look good together??? I think so! 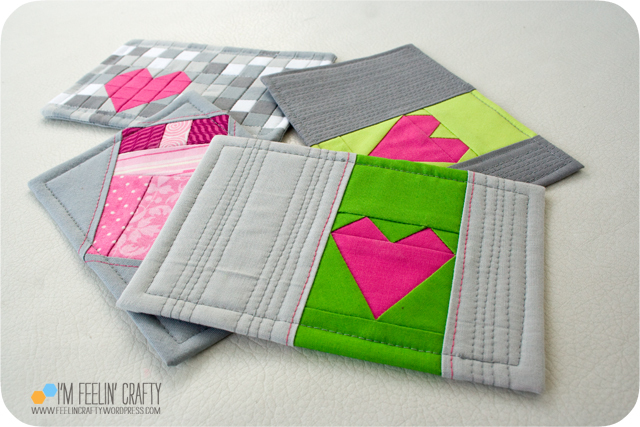 I LOVE making placemats! 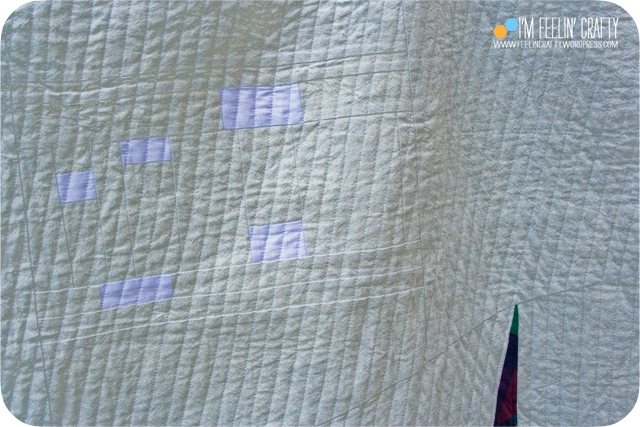 I think it’s the satisfaction of finishing a quilt, but it’s just a tiny quilt! 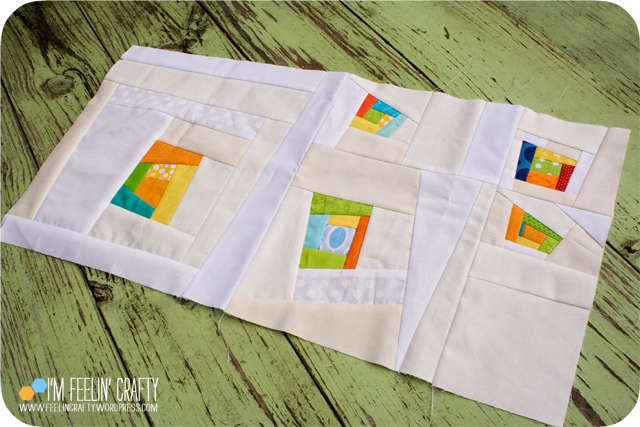 I don’t do many mini quilts because I don’t’ have anywhere to hang them. 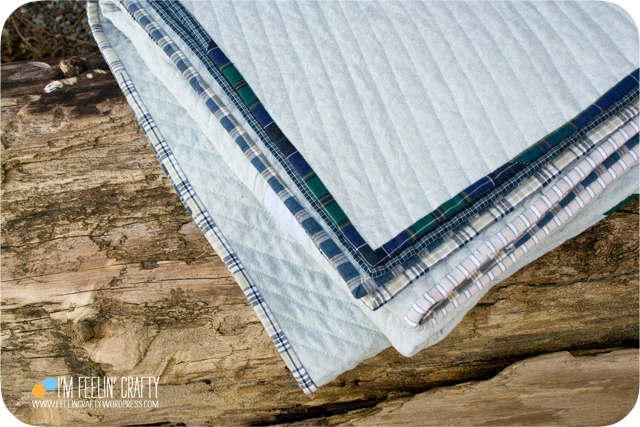 And they just get rolled up and stashed… But the placemats get used so I feel like I can make them! And they make for a fantastic gift! I’m super excited about this project! 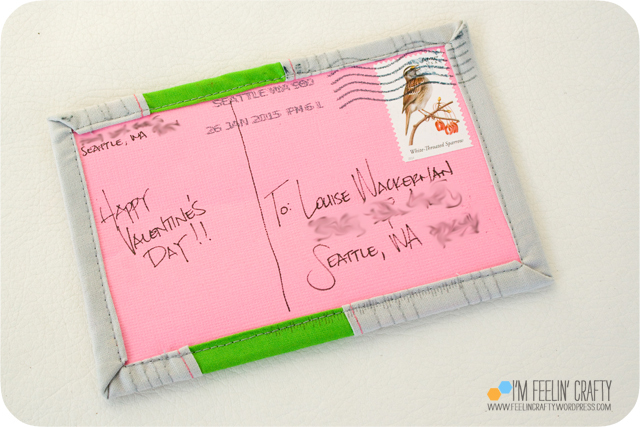 Our Seattle Modern Quilt Guild is doing a Valentine Postcard swap. When we first heard about it, I decided I was in, but I wasn’t super excited. Then I started making mine and got hooked!!! Obsessed! I came home and started looking around online for instructions and sizes so I could make some and mail them. 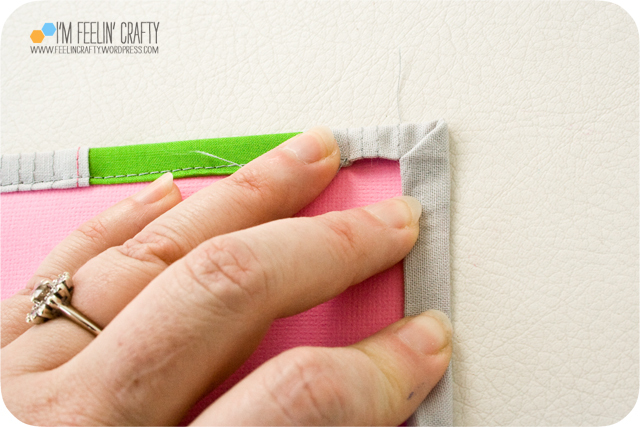 I couldn’t find a tutorial that didn’t include an applique type edge. 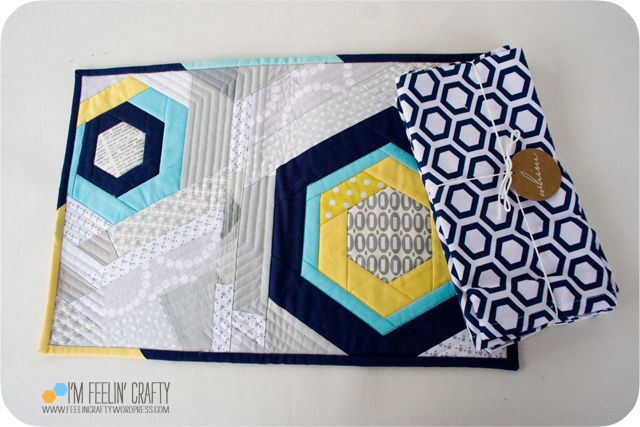 I wanted a more quilted look…. The first one I made was this one. 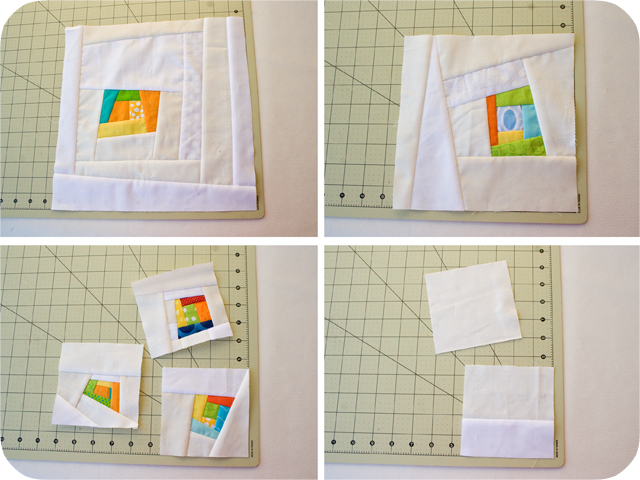 I used a bunch of 1 inch squares, but then couldn’t quite get the back to work. It’s also super thick for mailing with all the seams! 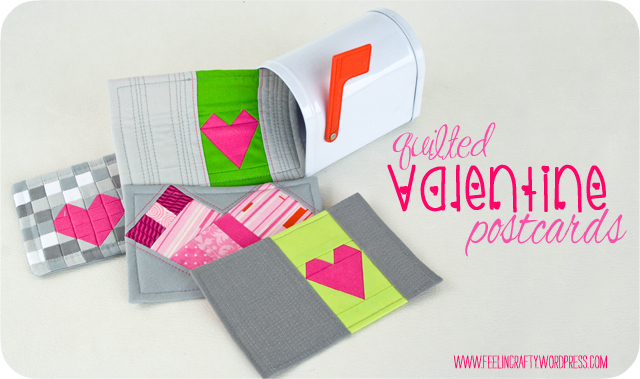 So as much as I love this one, it’s not what I wanted for a quilted postcard valentine up taking the plunge into the mailbox! So I made some more! But this time I made patterns! 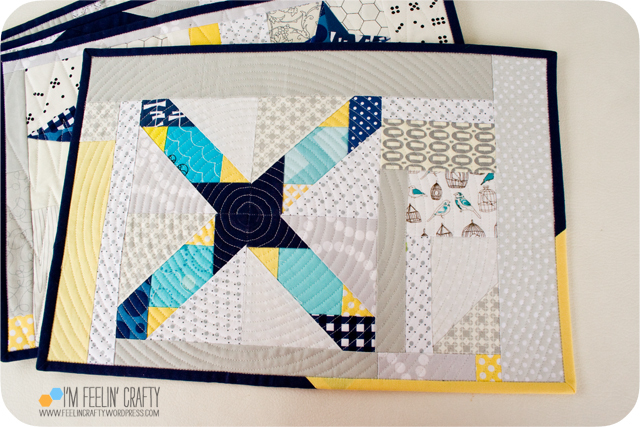 More paper piecing for me! I couldn’t decide on just one, so the pattern actually has 3 patterns in it! 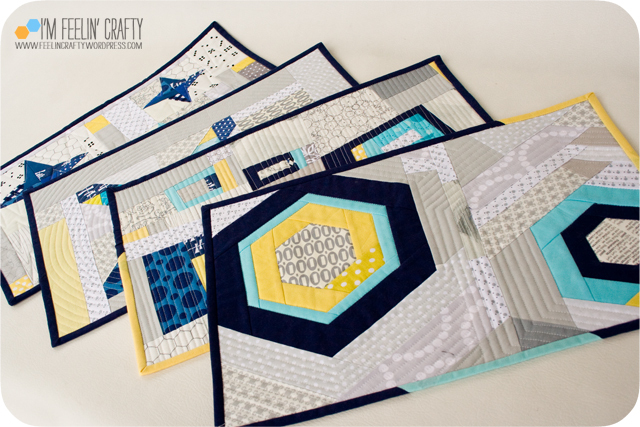 I have the set of patterns in my Craftsy store, for $5.00. But the tutorial is free! So let’s get to it! 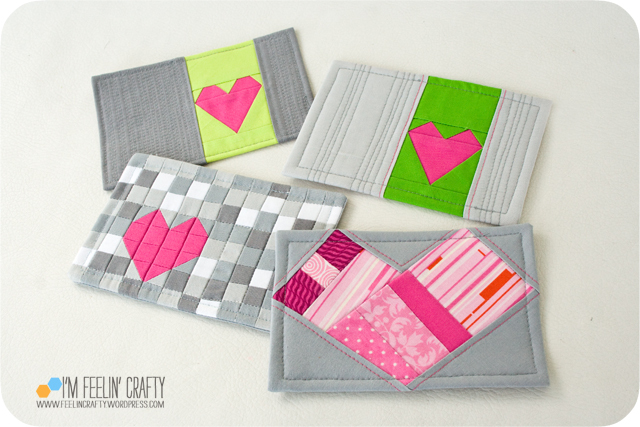 You’ll need a little bit of fabric, a 4×6 piece of batting, a 4×6 piece of cardstock, patterns and I use basting spray. 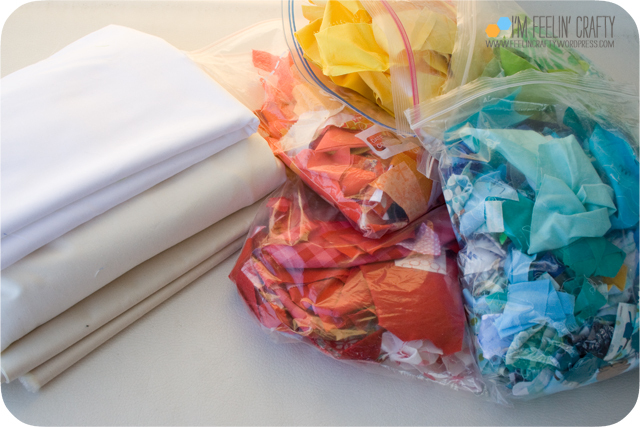 I used mostly scraps, so needless to say, you don’t need much fabric! 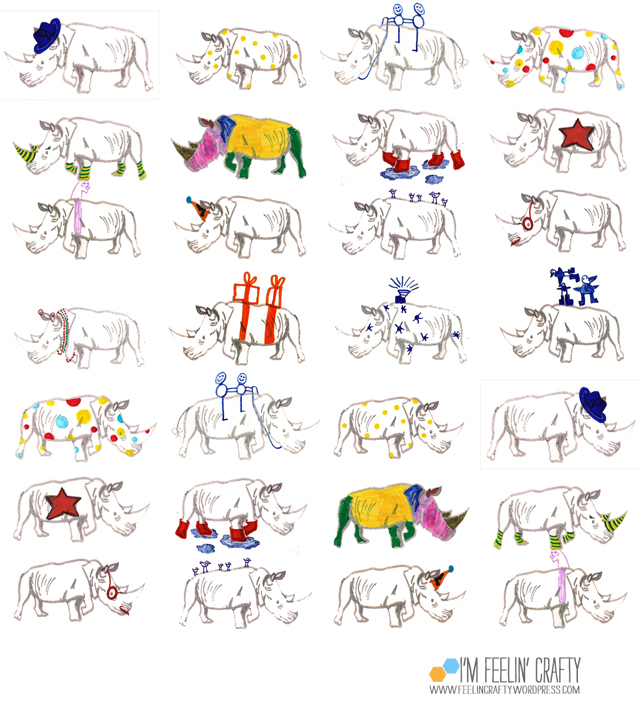 Print and pick your favorite pattern. Each pattern has two outside lines. One for making a 4.5 x 6.5 inch block. The second is larger for making the postcards. Paper piece your hearts! 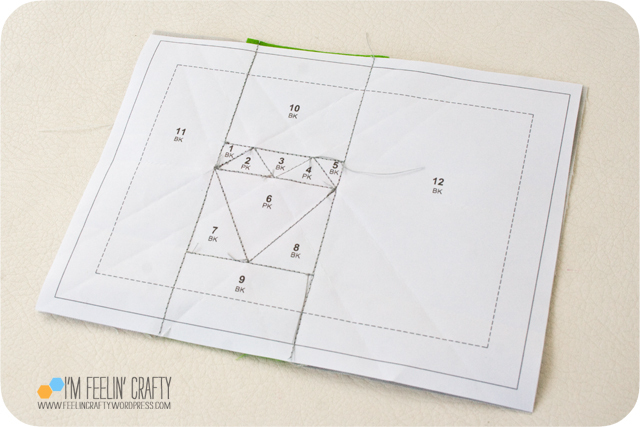 If you’re new to paper piecing, my tutorial on that should help! 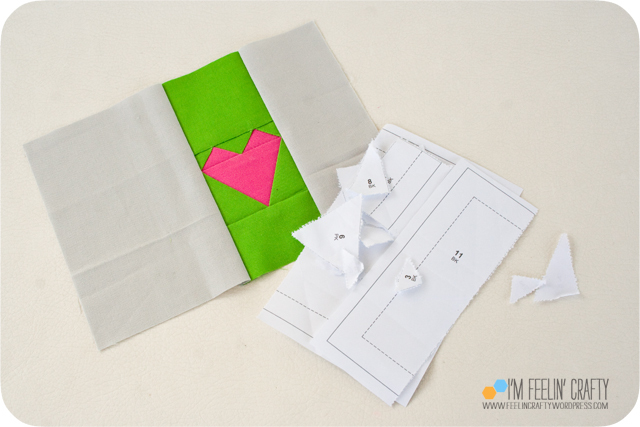 Sew together and then tear off the paper. Center the batting on the quilt block. I use basting spray, but you can pin too. 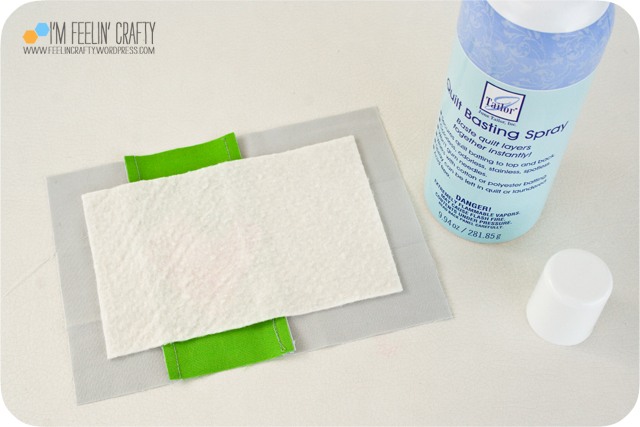 Spray the spray on the batting, not on the quilt block. You’ll have a little more than a half inch on each side. Quilt the block and the batting together. Iron the edges in half and over again. 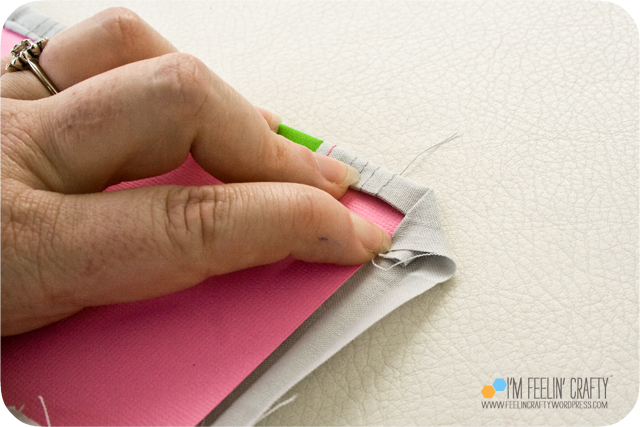 Spray baste the cardstock onto the batting. Time to do the ‘binding’! 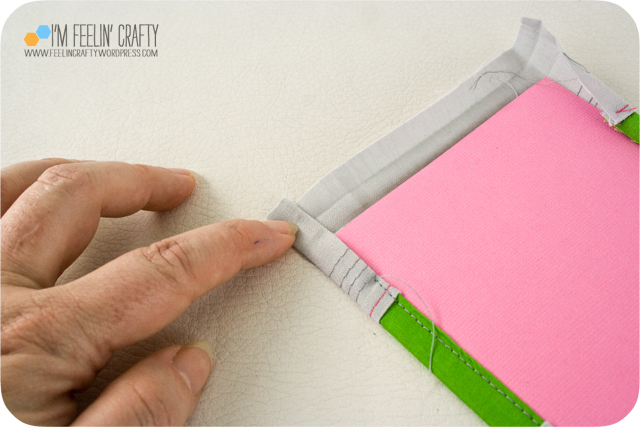 Fold the block over the edge of the card stock and start sewing. The corners are a bit tricky. 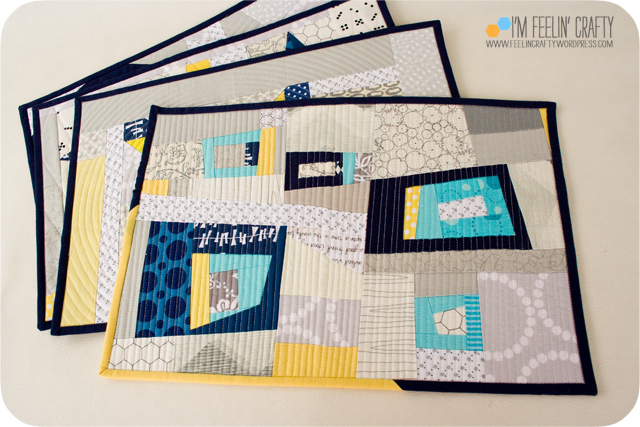 Especially if you have a bunch of seams like I did in my first postcard. 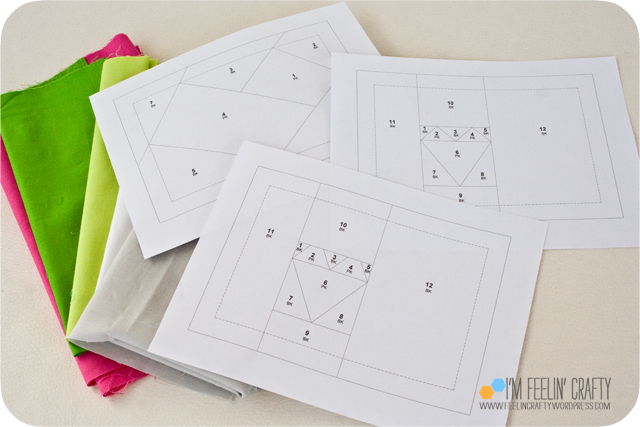 So following the pictures, fold, fold, fold and fold one last time. Then continue sewing! And you’re done! Ready for mailing! And just in case, I mailed one to myself, just to check… I did use a regular letter stamp instead of a postcard stamp. One, because I had it and I didn’t have a postcard stamp. And two, I though they might need extra postage since they are thicker than a plain postcard….. These are so fun! Pretty quick, too! Now I have to make more. I need some for the swap and now I want to send them on to family! Which one is your favorite! I usually don’t post my picks for my do.Good Stitches quilting months, but I posted a picture of the block coming together and I learned that some of my circle friends aren’t excited about wonky! 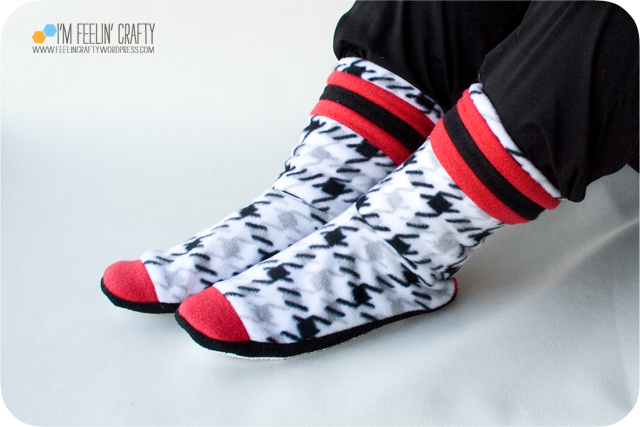 And I learned a little something about wonky while I was making these, so I thought I’d share! The block we’re doing for the February Nurture Circle of do.Good Stitches is made up of 5 blocks and 2 solid pieces. And once you put them all together you end up with 1 12.5 x 24.5 inch block. 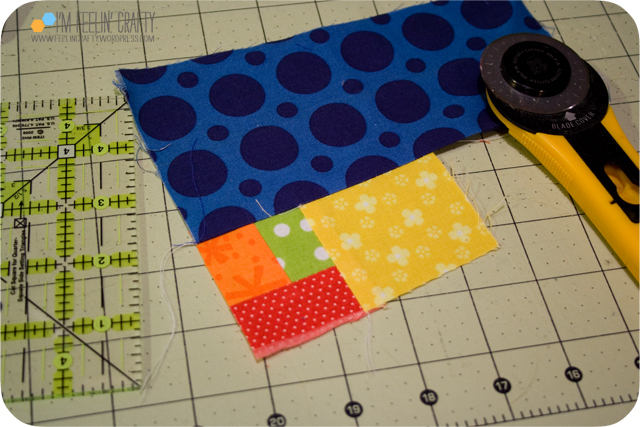 (2) 4.5 inch solid back ground blocks, these can be pieced or just a simple cut piece of fabric. However you do it, it need to be all background color. You’ll need some fabric, of course! Ha! For the center piece you’ll need scraps. Any scraps. 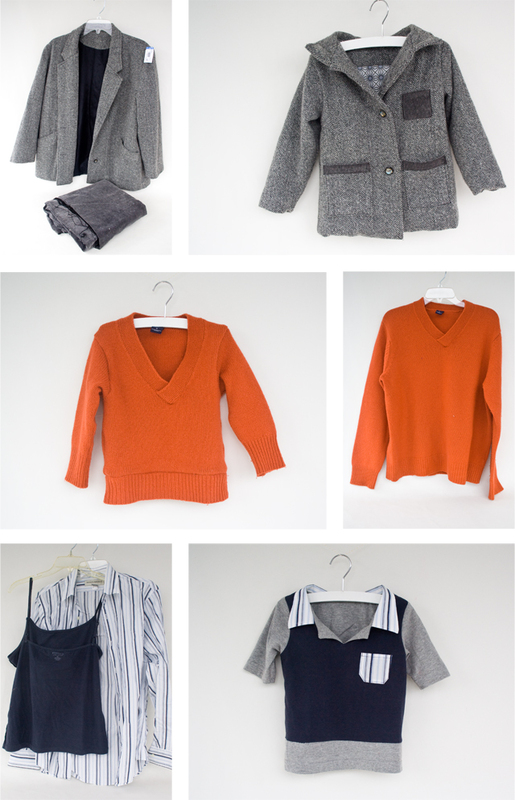 I’d prefer mostly solids, but… And an array of whites and/or creams for the outside. For mine I used, Kona Snow, Kona White and Kona Oyster. 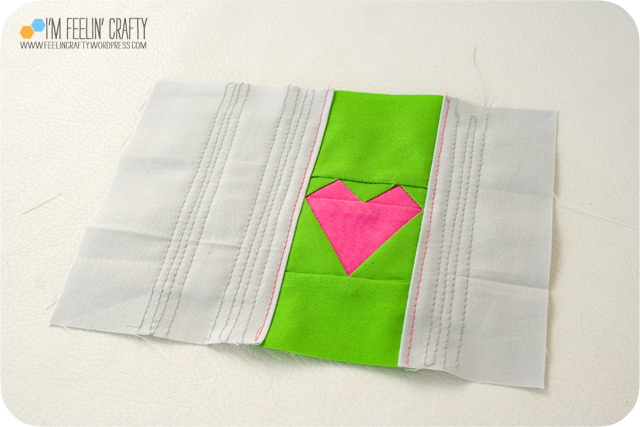 I also added in a few white pattern on white fabric scraps. Here’s what I learned. When I start with a square, the wonky log cabins always turn out looking nicer. This is a big ole oops that didn’t make it into my block! First off, I started with a wonky shaped center and tried to make it work. 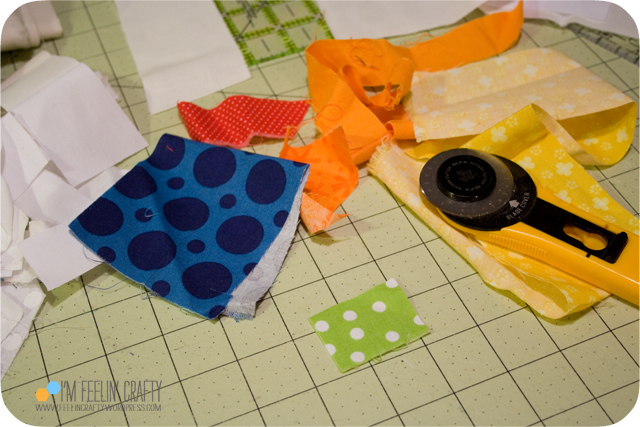 Secondly, I was using all scraps. So I sewed on this triangle. When I think wonky, I also think I can use odd shaped pieces. But, um, no. I mean I guess if you’re really good at it you can…. But mine always turn out nicer starting with a square. Then make your little log cabin. Mine stayed between 4 inches to 2 inches, approximately. 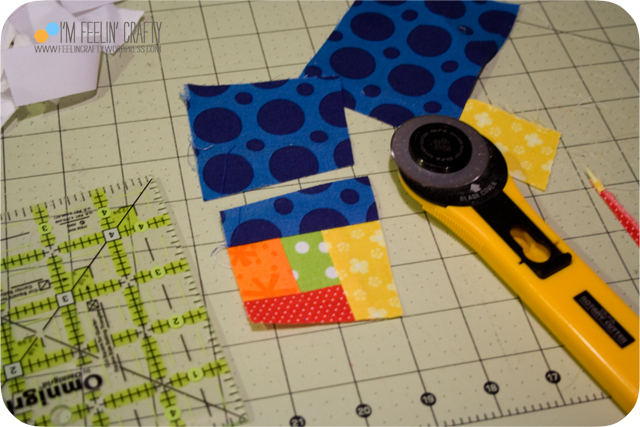 Here’s the key to wonky (at least for me)- The wonky part of the whole thing comes in the cutting, not the piecing! After piecing I ended up with a traditional square. 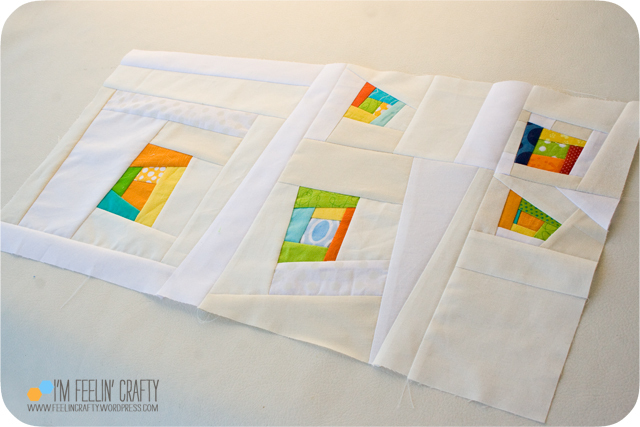 After cutting, I ended up with a wonky block! Just rotate that cutting square! Next you keep building on the center piece just like you would any log cabin. This one just happens to not be a square! For the do. 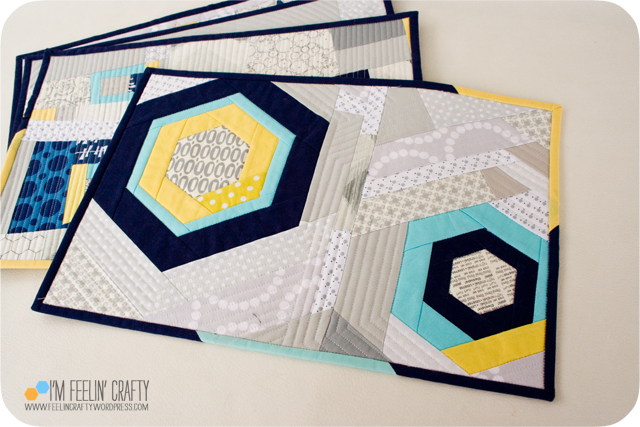 Good quilt, I’d like these to have the colored center off center. The off center thing seems to go along with the whole wonky thing, don’t you think! I use scraps, not straight pieces for the side of the log cabin. 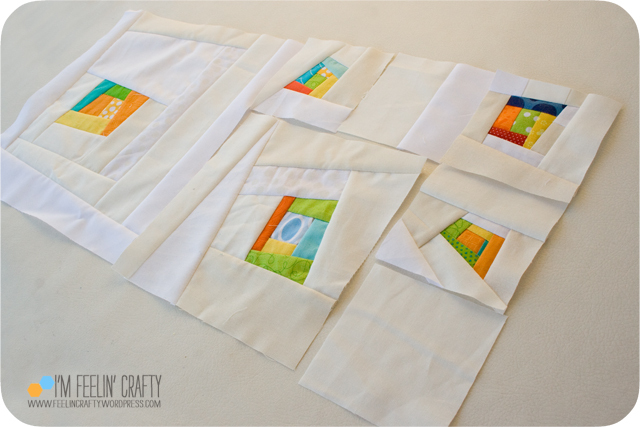 Different widths, some are pieced, most aren’t straight. This also helps add to the wonkiness! 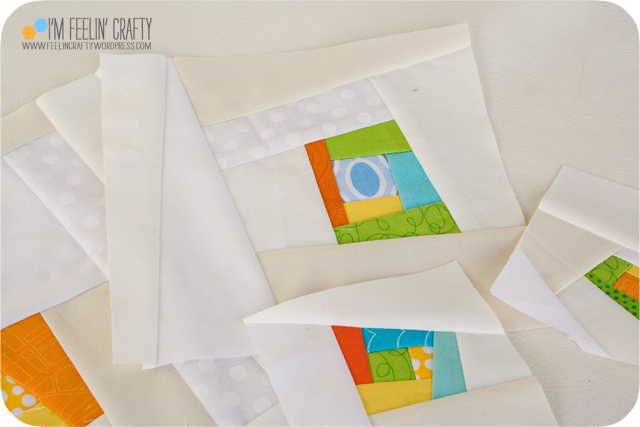 Just like you did with the center, you use the cutting square to cut your SQUARE off kilter from the middle. This is where you do want to cut a real square! 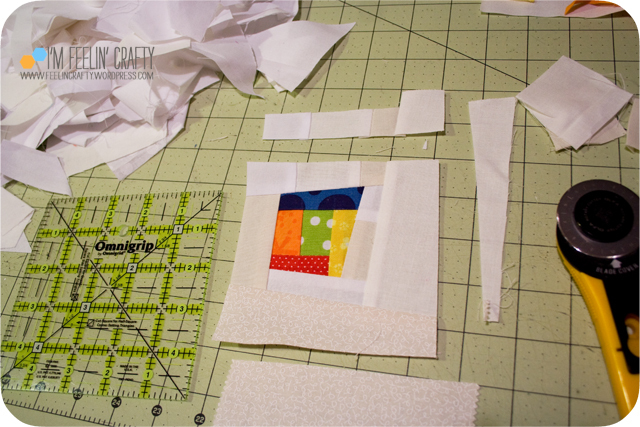 The fun part… Arranging the ‘mini’ blocks to make the overall block. Then back to the sewing machine! 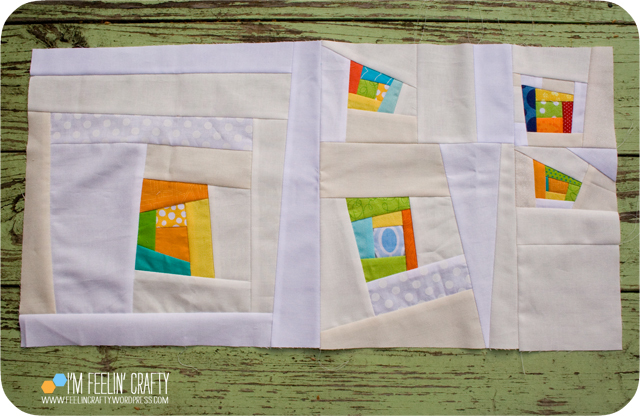 Sew the pieces together so that you end up with a 12.5 x 24.5 inch block. 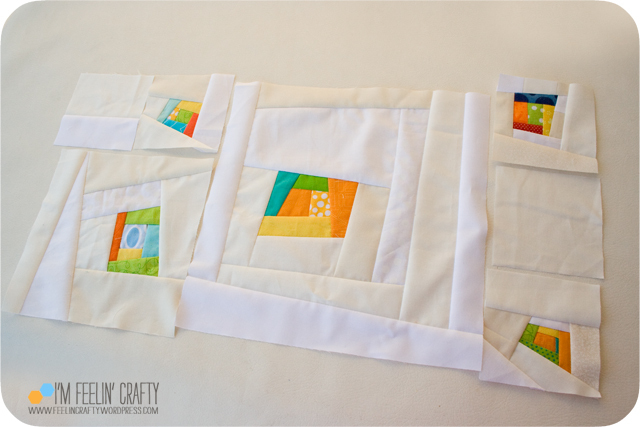 I’m so exicted to see how this comes together for the quilt circle!!! Yea!!! It’s so true! And I’ve been sewing! And traveling! And shopping online! So sorry, I was quiet this week! But I wanted to check in! I also have had a big deadline at work and as spur of the moment as plane travel across the country is, that’s what I’m doing! 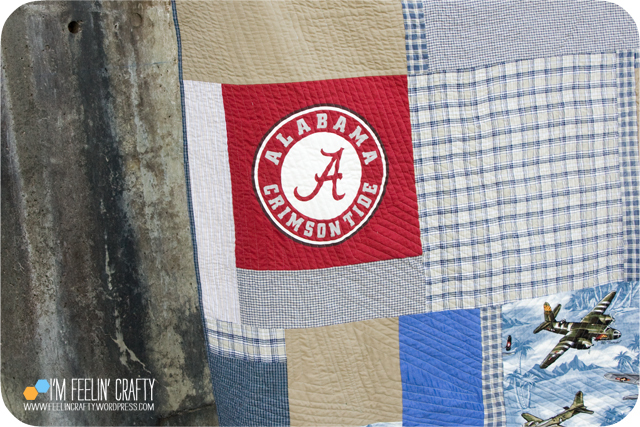 Since I was traveling home to Bama, this week, this fabric above jumped out at me. 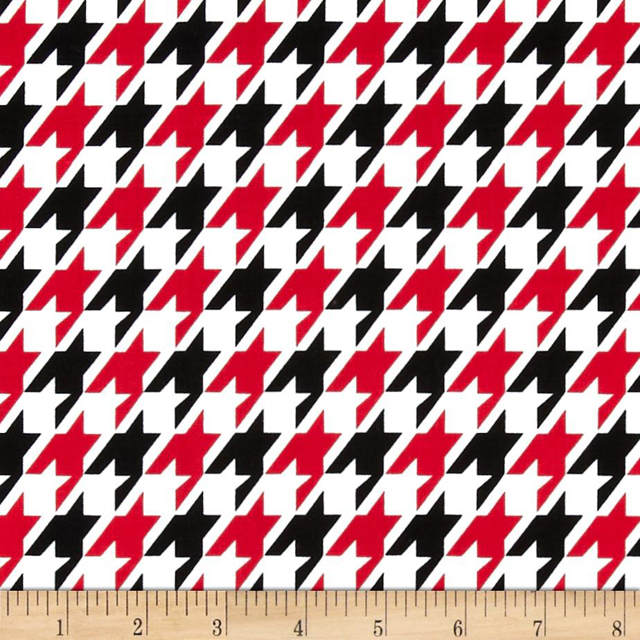 I think most ‘Bamians think of one thing when they see houndstooth. 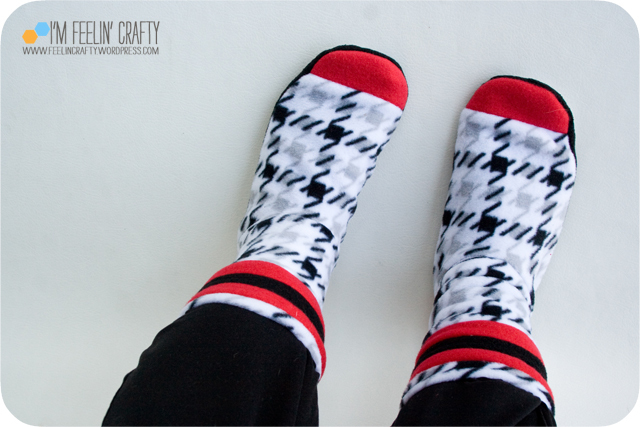 Especially red and black and white houndstooth… Alabama Football! I love this remix version by Ann Kelle for Kaufman. Oh, and shopping for fabric! I was sewing, and if you follow me on IG you already know this, but I was sewing the world’s largest paper piecing pattern and I ran out of fabric. So, I headed back to Fabric.com to order more. But if you order fabric, you have to order enough for free shipping right? So then I started looking around…. And I found these! None of which I need, but I love! 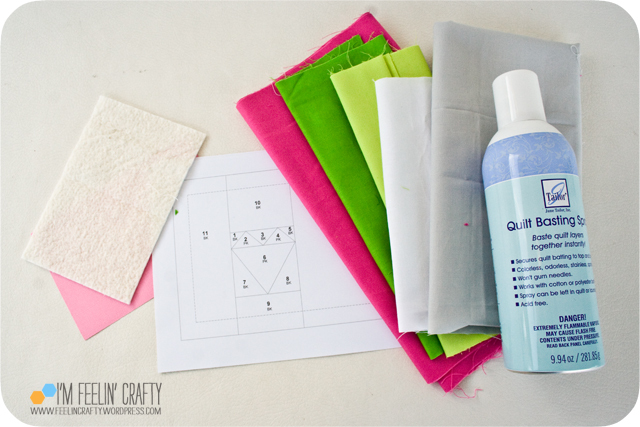 Since I got my original quilt fabric from Fabric.com, that’s where I went back to for the extra supply… I love Creative Thursday’s work, so I went to see if they still had any of her CHristmas fabric. 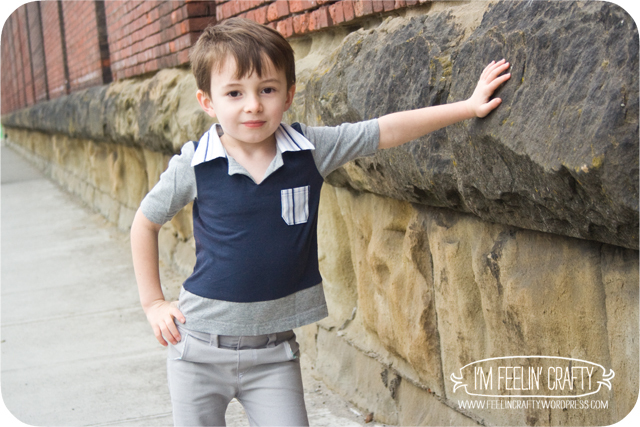 They didn’t, but I fell in love with the top three fabrics above! 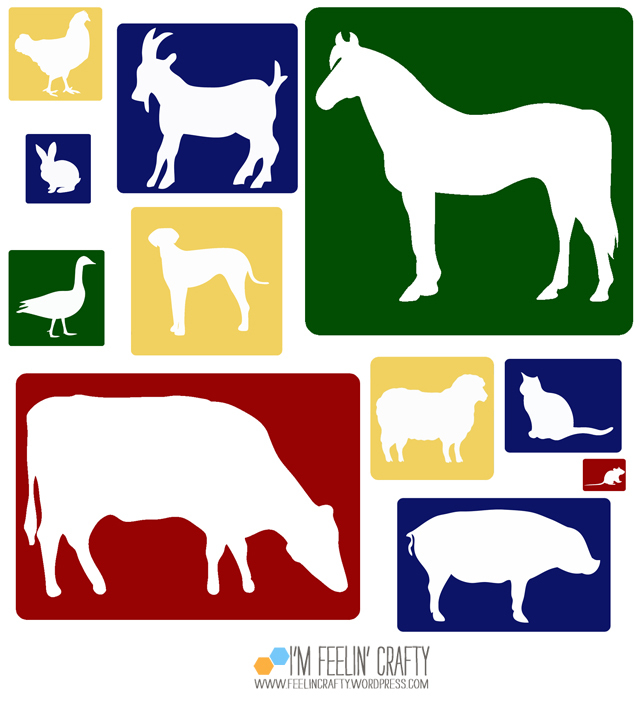 Top left, Just for Fun Whimsical Rabbit, Top Middle, Just for Fun Ballons and top right Ric Rac Rabbits. And we love Jeti’s!!! My friend Debbie over at A Quilter’s Table just used this fantastic Betty the Jeti Fabric in a pillow swap and I’m in love! I love the green she used, but on this particular site they only have it with the yellow background. But doesn’t it go perfectly with the Riley Blake Good Natured Timber wood grain in yellow that I want too?? And I love this super hero girl fabric by Anne Kelle. And I love it just because it’s all girls. No boys! And what do you see with this fabric??? Obviously, besides the monsters… PJ’s? I see pj pants!! And I really don’t like to do Christmas before Thanksgiving, but I couldn’t help finding more Christmas fabric that I don’t need! You can kinda see my color scheme here, huh! 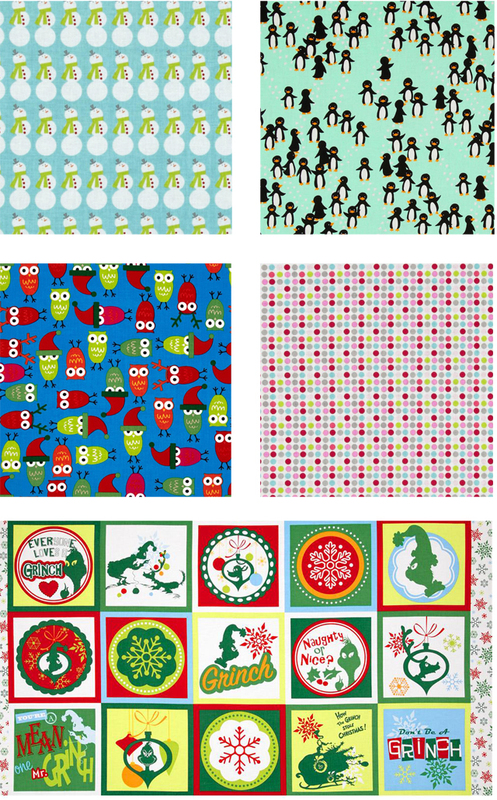 The top left is totally my colors with the teal and green Snowmen by Riley Blake. My step mom has a thing for penguins, that has kinda rubbed off on me, which is why I love the top right Silly Chilly Penguin fabric. The middle left is another Anne Kelle owl print that I love! I have it in teal, but I’m going to try to get the last yard of blue they have! And here’s my friend Debbie’s influence again, the middle right polka dot fabric also by Riley Blake. My son went through a Grinch phase as a toddler, so he’s a big part of our Christmas now. I love this Grinch panel! I want to make some Christmas pillows out of it! So what fabric are you buying???? Thanks for letting me check in! 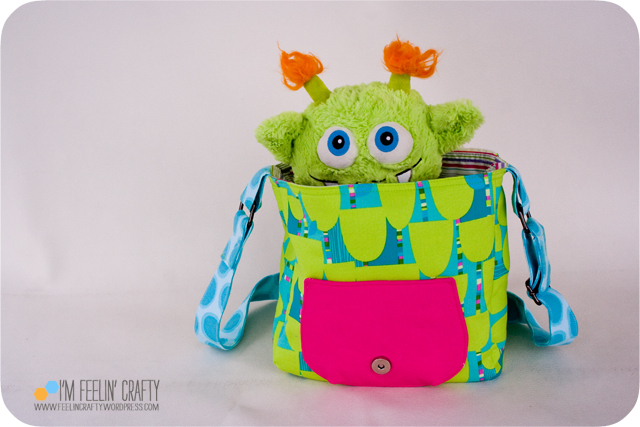 I’m on vacation without my sewing machine, so I’m hoping to get caught up on the blogging side and share some more of the fun projects I’ve been working on!!! Yea! Stay tuned! If you follow along with everything I do, I reuse or recycle or whatever you want to call it all the time! I love it! So this week’s Project Run and Play challenge was one I didn’t think would be a challenge. I was wrong. I came up with what I wanted to make first. Maybe I should have found the materials first…. The coat was the only piece I bought. I mean the original coat, that is. It started as a woman’s coat that I found in the Men’s department at our Goodwill! 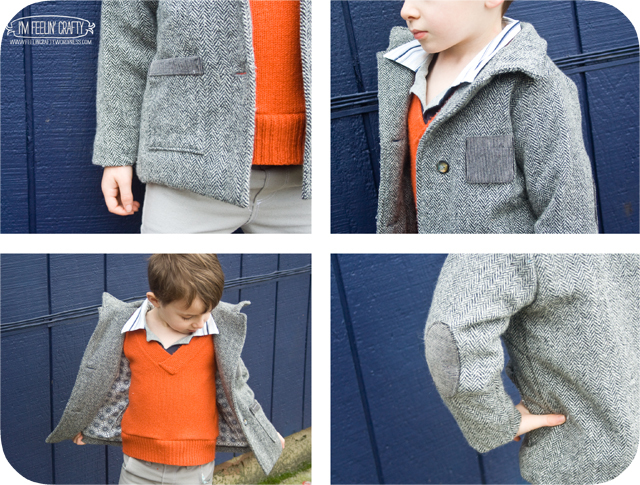 I was going for more of a solid wool coat, but the kiddo and I went shopping and found a handful, or armful, of coats on half price that we liked. So we brought them all home to see which one we liked best. And this is the one the kiddo picked! For the coat I self drafted the pattern based on other coats and based on the pieces of the coat I wanted to reuse. Some pieces were upside down cuts where others were little pieces from here or there! 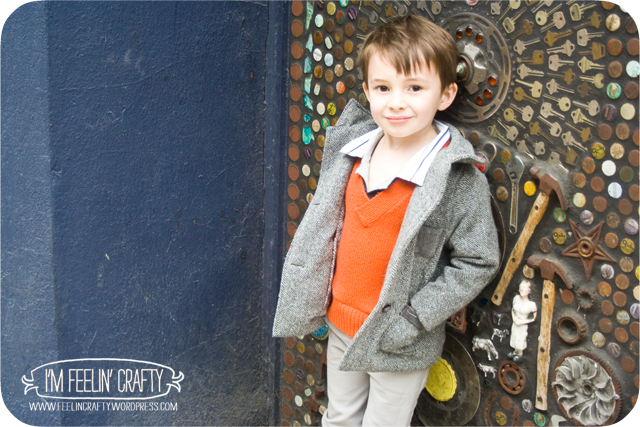 Once I was putting it all together, there was part of me cursing the fact that I could have just bought a stinkin’ coat for him for a lot less time and energy! But in the end I’m happy with what I accomplished! 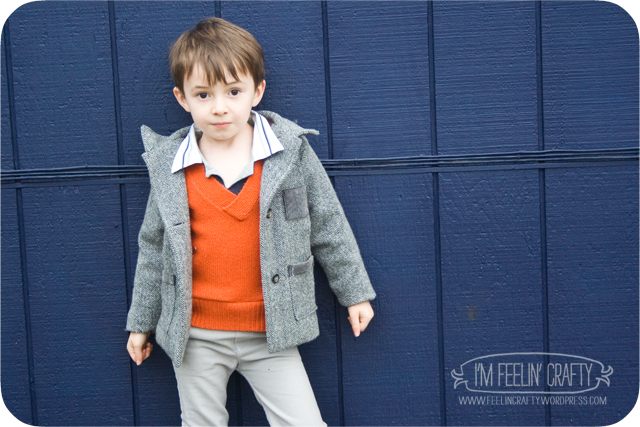 I love the little elbow patches! 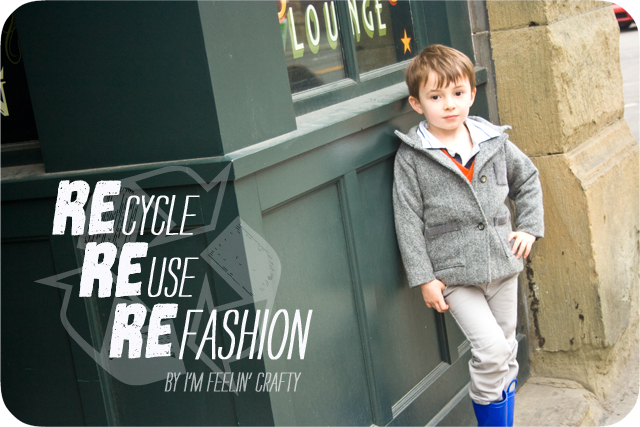 The lining is the only piece that’s not a recycled fabric. 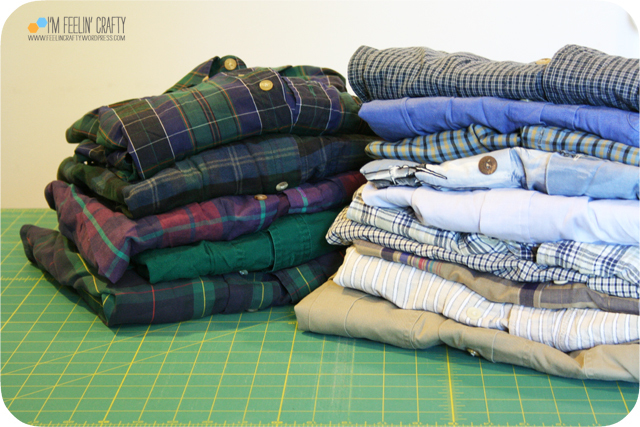 The pockets were originally smaller and all three were the corduroy and smaller. I liked it. Then I didn’t. Neither did my husband. (do you see a recurring theme with my husband and I and my pockets??? remember the fox coat pockets?) So off they came. I enlarged them and changed them. I have to give credit to the husband for some help with the pockets this time. 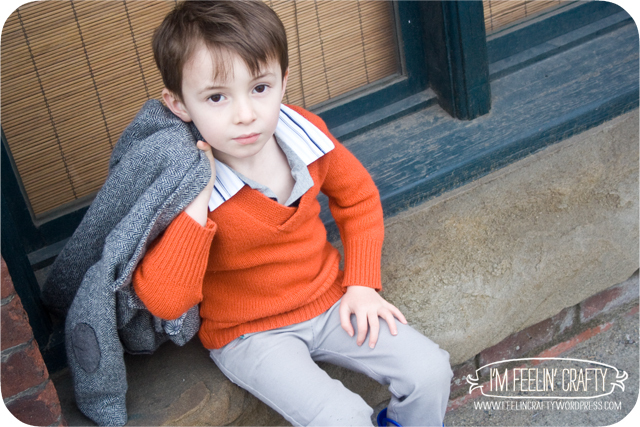 The sweater was also self drafted. Just a simple copying of another sweater that fits! Easy Peasy! 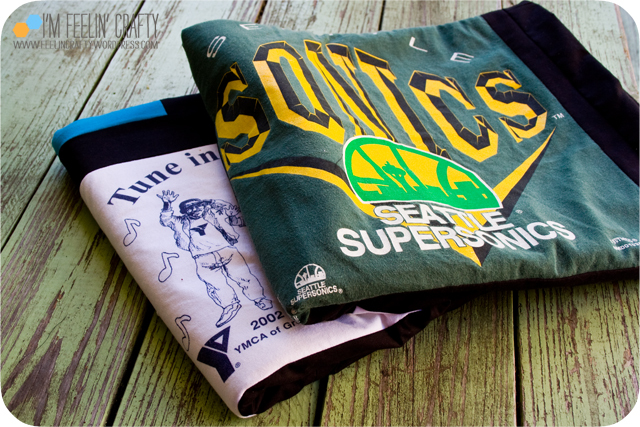 The tee is the great old standby, The Flashback Tee once again! But I added the collar and the open front. 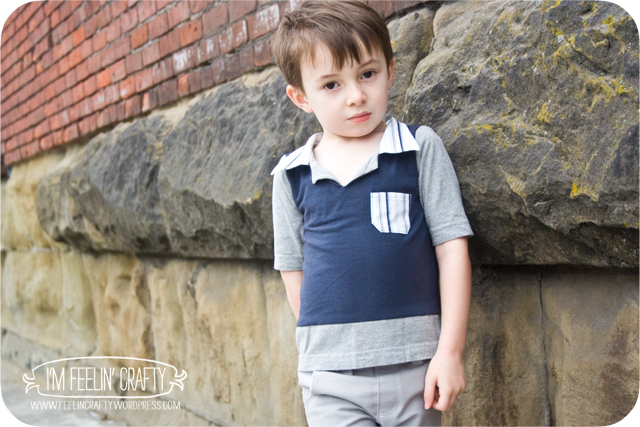 And then the blue shirt that I wanted to use was too short, so I added the grey to the bottom! The before and afters! I almost forgot! The coat and the corduroy. 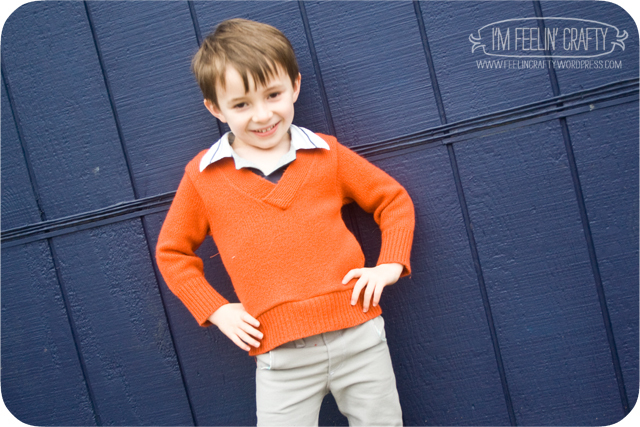 The corduroy wasn’t something else before, but I did purchase it second hand… The big sweater to little sweater. And the navy tank top, grey t-shirt (not pictured) and the men’s shirt turned t-shirt! I don’t know. Not my best work, I don’t think… But I like it! Thoughts? I have no idea why that one collar corner keeps popping up! Ha! 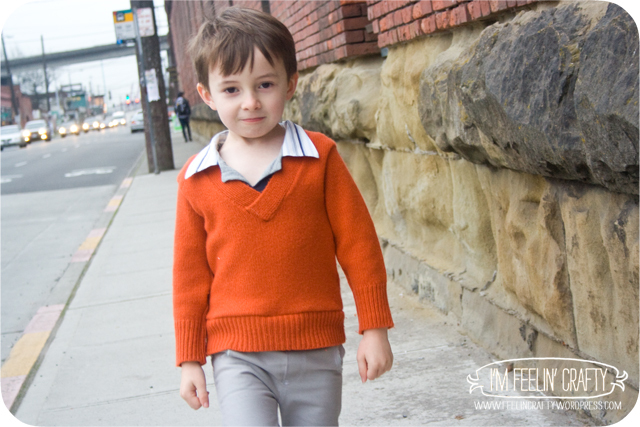 And since it’s also Kids Clothes Week, can this count as three outfits? Where are we off to next? Want to come along?